If you’re in search of a quick dinner, you’re in the right place! 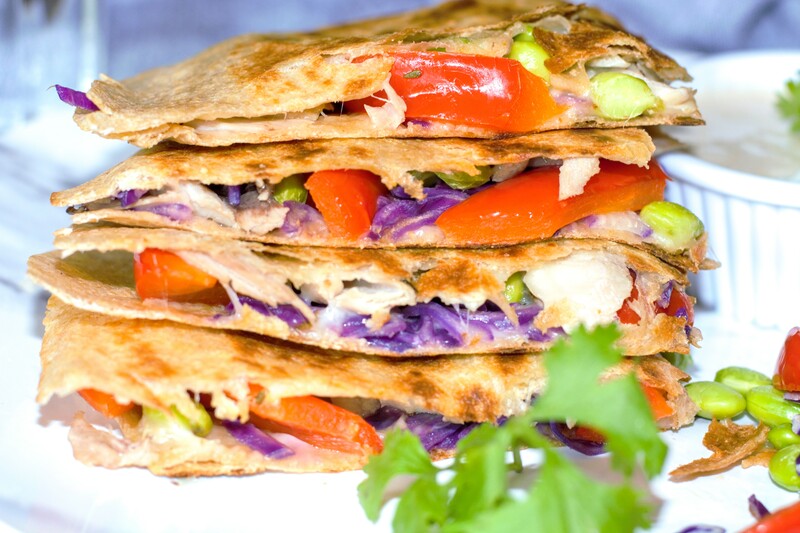 These quesadillas have an Asian flare and are easy to make, whether you’re single or for the entire family. Pair these with a quick salad or eat them by themselves because they are loaded with veggies! I also made a quick yogurt dip that can be served on the side. The good in this? Purple cabbage is full of anthocyanins. Anthocyanins are naturally found in plants and have red, purple and blue pigments. These compounds help protect the heart and possibly help protect against cancer also. Other sources include berries, grapes, eggplant and blood oranges. Prepare dip by combining Greek yogurt, hoisin sauce and soy sauce. Set aside. Heat large non-stick skillet over medium heat. Coat with cooking spray, if desired. Take one tortilla and top with 1/4 c cheese, bell pepper, edamame, purple cabbage and chicken. Top with remaining cheese and cover with second tortilla. Place in skillet and cook 3-5 minutes on each side until golden brown. Serve with Asian dip.